Behavior treatments for Asperger Syndrome focus on teaching appropriate skills and behaviors while reducing or eliminating negative, dysfunctional habits. To be fully effective, behavioral techniques must be consistent and occur in all appropriate settings. Dealing with negative behaviors in children with Aspergers is difficult, mainly because they may fail to respond to traditional discipline methods, are often unable to process the consequences of their behavior and actions, and have difficulty understanding social expectations. Many negative behaviors exhibited by children with AS are a direct result of the condition. Parents, teachers, and professionals must consider this when developing behavior treatments. Those with Aspergers may exhibit a lack of common sense. Aspergers children may be unable to resist giving in to their obsessions and compulsions, and this is not a sign of disobedience. Because Aspergers children have difficulty interpreting social cues and tend to be egocentric, they cannot fully appreciate what impact their behaviors have on others. Those with Aspergers may need help modifying their behavior. While they can be manipulative just like any other child or adult, over-stimulation and an inability to understand normal social cues trigger the majority of their behavioral problems. Positive reinforcement is generally much more effective for children with Aspergers than punishment. Cognitive-behavioral therapy and stress management are important in helping a child or adult with Aspergers learn to deal with anxiety, anger, and obsessions. Behavior treatments for Asperger Syndrome are effective both on an individual basis and in a group setting. Therapists typically use two primary methods of behavior therapy to improve social and self-help skills and reduce the frequency of self-injurious behaviors in children and adults with Aspergers Syndrome. Modeling - Modeling involves demonstrating a desired skill or behavior, and then guiding or encouraging the Aspergers person to imitate it. Modeling is a useful behavior treatment in nearly all settings. Operant Conditioning - Operant conditioning is a complex therapeutic approach than modeling is. It involves breaking down desired behaviors into steps, teaching each step individually, and then reinforcing the appropriate response by rewarding each success. Over time, these therapeutic procedures significantly reduce unwanted behaviors and produce desired, functional behaviors. Therapists should proceed slowly to prevent overwhelming the Aspergers client, and must avoid displaying or provoking intense emotional reactions. Students with Aspergers may be reluctant to participate in class, have great difficulty initiating or maintaining eye contact, experience meltdowns with even minor changes in class routine, and may have difficulty completing assignments as instructed. If external stimulation is overwhelming to the student, he needs a quiet, safe place to retreat to, such as a resource room or guidance office. Teachers should watch for problems with social interactions and bullying, and they should intervene immediately should an issue arise. Teachers working with students with Aspergers should receive training in dealing with the unique challenges AS children bring to the classroom setting. 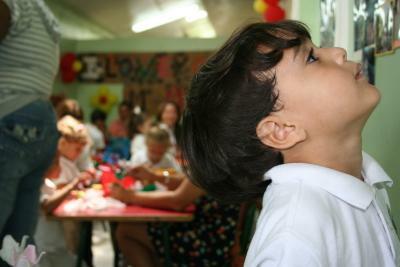 Classroom behavioral interventions depend on the specific child, but may include role-playing, modeling of appropriate behaviors, reward systems for completing tasks and participating in classroom activities, and one-on-one counseling to deal with anxiety and to encourage the development of social and self-help skills. Many parents have a difficult time distinguishing between disobedience and misunderstanding in their Aspergers children. Because they may not interpret social cues correctly, it may be difficult for an Aspergers children to understand what is expected of them, and they may not understand the impact their behavior has on other members of the household. Children should be encouraged to socialize and become as independent as possible. Parents of children with Aspergers Syndrome should receive professional training so that they can continue working with their children at home. Behavioral techniques are best when adapted to suit the home environment, and they should focus on issues directly related to home life and self-help skills while continuing with the goals established in school. Uncovering triggers for negative behavior is important. Keep a behavior diary, noting any events surrounding negative behaviors, the details of your child's responses, and any unintentional reinforcement your child receives that may be encouraging repeat behavior. The motivation behind negative behavior in children with Aspergers is often very different from other children, which makes identifying the cause of those behaviors and developing a behavior treatment plan very difficult. For example, if your child throws tantrums during dinner, his motivation is likely something other than a lack of interest in eating. Something as simple as an uncomfortable chair may be triggering the behavior. His desire to get off the chair is his motivation for the tantrum, and being sent to his room as punishment is the reinforcement. It is necessary to uncover the real reason for the tantrums, find a solution for that problem, and reinforce the desired behavior without inadvertently reinforcing the negative behavior. The most important thing to remember when it comes to behavior treatments for Asperger Syndrome is that everyone in the child's life needs to work together as a team. Parents, mental health professionals, pediatricians, neurologists, educators, occupational therapists, and other professionals must collaborate to make certain everyone involved meets the needs of the child.